We met Brandon because he needed someone to fix a botched bumper job on his truck. We took care of it for him and he let us know he was in the Market for a Jeep. He said he was looking for an old CJ and he would bring it by for us to fix up after he finds one. After a few months Brandon showed up at the Shop with "Sadie", which did not look anything like the name implied. 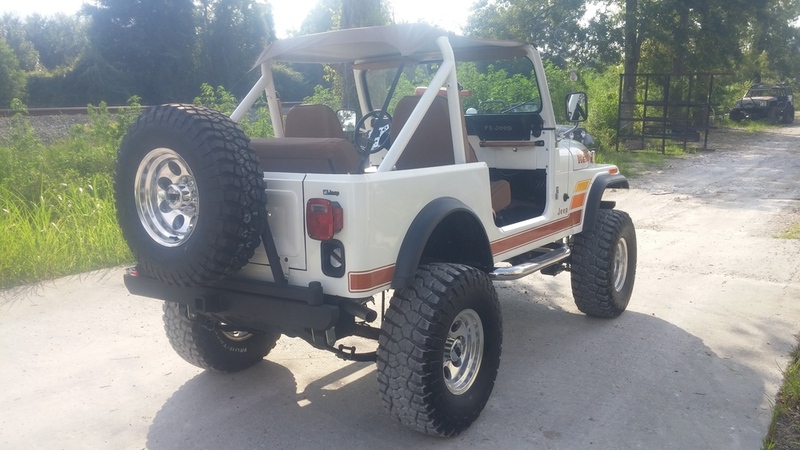 Sadie was a white-ish 1983 CJ-7 with a 258 straight 6 and a torqueflite 999 transmission. Some of the highlights included springs that were on backwards in the rear, rust spots throughout the body in random spots, gauges that did not work, a heater that was broken, a body lift that was only done on the tub and not on the grille which gave it a nice slant look and bent the fenders, a couple of tweaked and rusted out crossmembers, a bumper that was welded to the frame with holes drilled through the front cross member because mounting the winch became an afterthought at some point, a torn top, tires that were bald,a bunch of fluid and exhaust leaks, bad brakes...the list really goes on and on for a while but I think you get the picture. Brandon's goal was to go through it in steps and make it a safe driver. Well the more we looked the more "less than safe" things we found with it. We spoke to Brandon about how much more it will cost if we go through it in stages instead of refurbishing everything we can with the frame off. This would help us avoid a lot of redundant costs as we could fix and refurbish at the same time....at least that's how it started. Before we knew it Brandon was coming at us left and right with ideas about things that he wanted to fix and upgrade. There were even points where we questioned some of his use of chrome but he did a really great job laying out what he wanted and by the time "Sadie" left the shop everyone here was drooling over her. Congrats on the beautiful CJ-7 Brandon! I will do my best to outline the build on this jeep...just in case any of you wanted to know what went into it. This is where we found out exactly how many different shades of "spice" there actually are. 6. We printed a new automatic transmission gear selector indicator with our 3D printer since you can not find these anywhere. 11. Several of the factory gauges still worked but a couple had to be replaced - I honestly can't remember which ones but we use crown and omix for our gauges in case you are curious. 12. Refurbished the heater with a new heater core and blower motor. We also replace all of the factory cables with new cables and knobs from Omix-Ada. There were a few other things that had to be done to get this heater system working but they are quite boring and I won't go into detail on that. 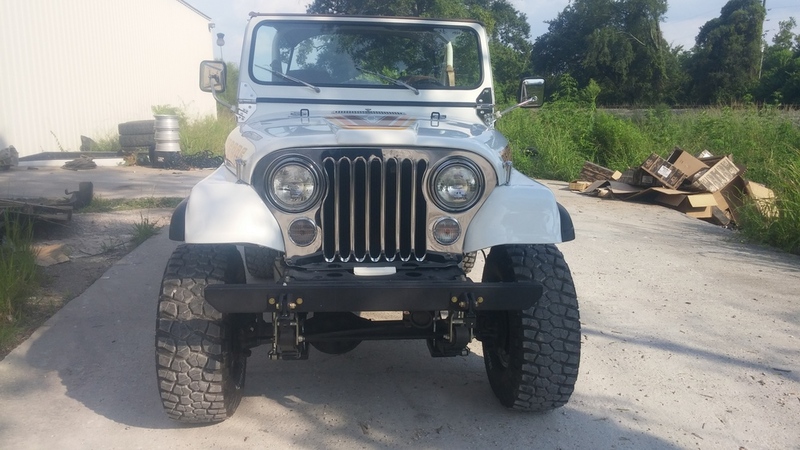 There were quite a few rough spots and botched modifications done to this CJ over the years, fortunately we were able to undo everything and make it right for Brandon. 1. Cut off old bumper, repair the front cross member, replace the rear cross member with an omix-ada rear cross member, and "un-tweak" cross members that were bent due to a botched body lift. 2. Rubicon Express 4.5 extreme duty lift (my favorite CJ spring under lift) and procomp es3000 shocks to soften up the CJ's ride a little. 4. Replace body mounts and bolts with energy suspension body mounts. 6. Searchers 4wd front basic bumper and Searchers 4wd rear bumper with tire carrier. Some of the toughest obstacles on this rebuild centered around the torqueflite 999 auto trans. 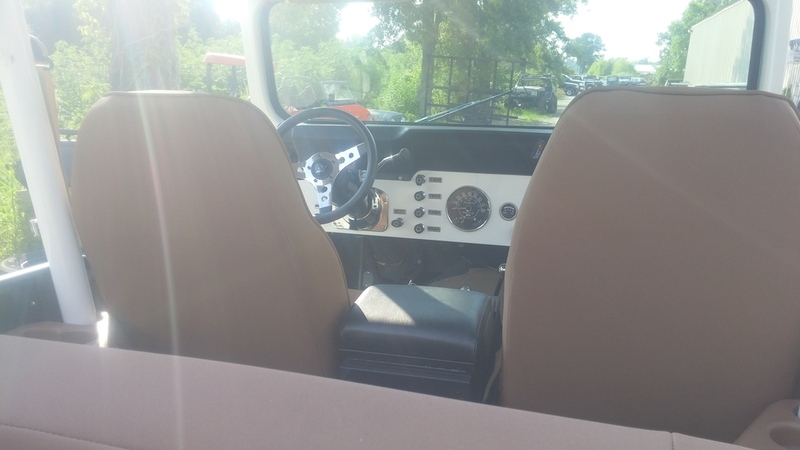 The biggest problem is that there is literally no aftermarket support for this auto in a CJ. We ended up having to be creative and borrow a lot of ideas from the aftermarket accessories for the torqueflite 727's typically found in hot rods. On the plus side a majority of his wiring was in great shape and just needed some tlc. 5. Ididit (yep, thats a brand name) transmission cable auto trans shift linkage. 12. It came with headers so we ran a dual exhaust through two Flowmaster mufflers to give it a nice, not too aggressive cruising tone. 13. 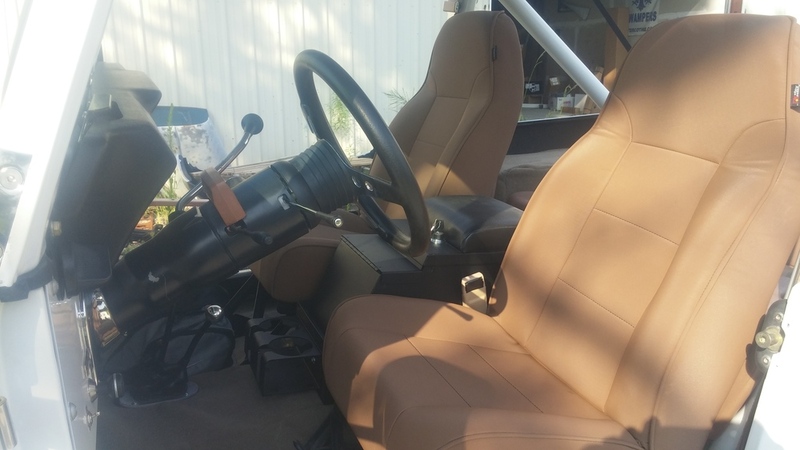 We fit the twin stick shifter with some "shift knobs" were provided by Brandon, they are actually the ball parts of ball in socket joints that surgeons use when rebuilding a knee or shoulder. Don't worry, there were no victims involved. 17. We replaced the worn out steering column with a auto tilt column from Steering Columns Galore. 18. Quite a few new hoses. 19. Replace the radiator overflow tank since the old one was broken and had half of a coke can tied on with a shoe string as a overflow tank cap...I am not exaggerating. There was a ton of work that went into this jeep and a lot of reconditioning of small, hard to find parts. If you have any questions about any of the work we have done or you want us to knock the dust of your old CJ like we did for Brandon please let us know.